Technology can be a path forward for Baltimore’s most pressing issues, with the industry creating jobs and products to improve education and reduce crime, a panel of Baltimore business and industry leaders said Thursday. The panelists also suggested that Baltimore has some strengths, like cybersecurity jobs, that show it is on the right track, despite some of the negative stories. 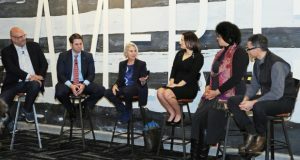 The panelists spoke at The Future of Charm City, an event at Betamore’s space in City Garage in Port Covington. The panelists included Hemmerly, AT&T mid-Atlantic president Marc Blakeman, Baltimore Development Corporation president William H. Cole IV, Betamore co-founder Greg Cangialosi, blogger and activist Alysha January and Heidi Klotzman, founder and CEO of Heidnseek Entertainment. Former Maryland Deputy Attorney General Thiru Vignarajah moderated the panel. Among Baltimore’s greatest strengths is its connection to the cybersecurity industry with nearby Fort Meade and U.S. Cyber Command. Port Covington will be adding to that with its “Cyber Town USA” plan that could bring more than 40 cybersecurity companies to south Baltimore. Part of creating a hub for cybersecurity jobs, though, will require training a workforce that can fill those jobs. That will mean doing a better job of educating kids to be prepared to take these jobs. Baltimore schools need more technology to do their part, Cole said. Improved technology could also help the city in an area it may need the most help: crime. Cole referenced the city’s recent deployment of ShotSpotter, a nearly decade-old technology that helps detect gunshots. Cangialosi pointed to other tech developments, such as software in cameras that features facial recognition, and the proliferation of security cameras, including doorbell cameras like Ring and Nest. He suggested police could use a network of cameras to help stop crime. But Hemmerly worried that as society moves forward with all of these tech solutions to problems, privacy concerns rise, too.